Aesop has been in Singapore for the longest time... I think it first opened in Ngee Ann City? I remember looking at the apothecary-like store from the outside and wanting just about everything. Solely because of the packaging. But I never stepped into their store until last December (Too many brands to discover, and only one face. *exasperated look*). And after about an hour, came out all happy and poor with 2 pretty bottles. 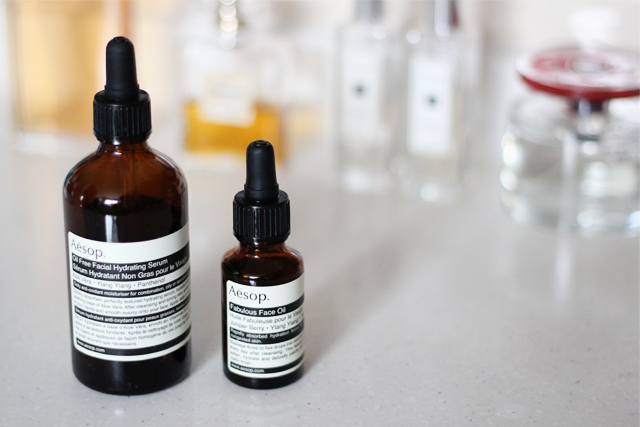 I got the Aesop Oil Free Facial Hydrating Serum and the Aesop Fabulous Face Oil. These 2 make up my morning routine for most part of this year. Aesop Oil Free Hydrating Serum is a lightweight serum for combination, oily or troubled skin. It is a bottle of Vitamins B and C, botanical extracts and antioxidant-rich ingredients, steeped in an Aloe Vera base. An alternative to cream-based moisturizers, it helps to soften our skin, leaving it smooth with a matte finish. Aesop Fabulous Face Oil contains 9 carefully selected botanical extracts that hydrates and balances our skin. 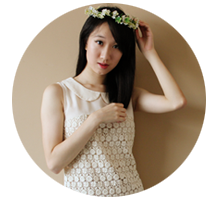 It detoxifies patchy skin, imparting a smooth and matte finish. Each morning, I mix 5 drops of the Oil Free Hydrating Serum with 1-3 drops of the Fabulous Face Oil. I apply it to my face in circular motions and wait for it to sink into my skin completely before applying my makeup (I take this time to blow dry my hair. :D). Upon application, it feels a little sticky because of the Aloe Vera base. But it sinks into the skin pretty quickly, leaving a smooth, comfortable and rather matte complexion. Foundation goes on seamlessly. I have combination skin and I find that these 2 work great for my oily areas. My T-zone begins the day matte and at the end of the day, it's just a tad oily. However, my inner cheeks tend to dry out towards the day and there will be a little bit of flaking. :\ Where zits are concerned, I don't see any difference; I still break out (I'm treating this as a sign of youth. *two thumbs up*). I have been playing around with other oils, so it's very unlikely that I'll repurchase these 2. Maybe the serum, but definitely not the oil because it was pretty normal for me. :\ I think they will be more beneficial for those with oily and troubled skin. But that's not to say that I'll stop exploring Aesop. I really want to try the Purifying Facial Exfoliant Paste because apparently, it leaves your skin soft as a baby's bottom. Mmhmm.